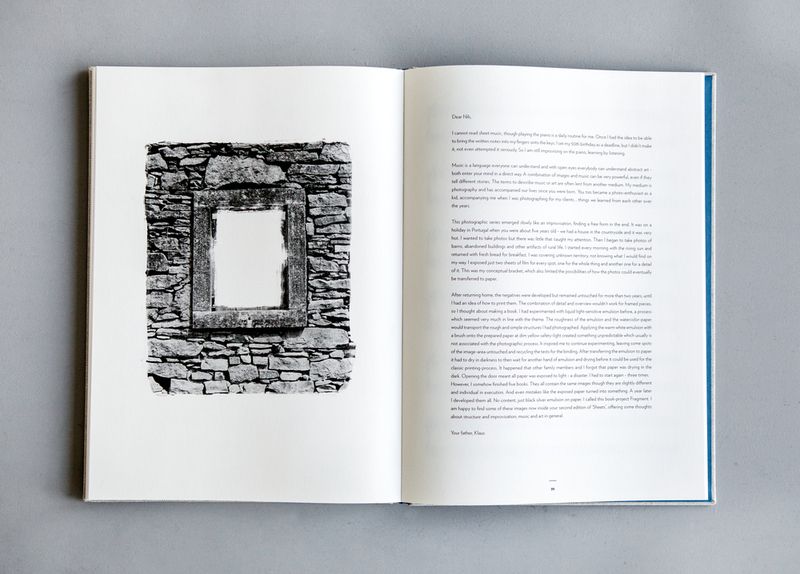 Nils Frahm’s second volume of art and music, ‘SHEETS Zwei’, is no ordinary book of printed pieces. Zwei opens up an intimate dialogue between Nils and his reader, not only offering fans the chance to dive into some of Nils’ most loved pieces, but also including instructions and diagrams on how to prepare your piano to create Nils’ signature ‘Una Corda’ piano sound. Through Zwei and its many dimensions, fans are brought deeper into Nils’ world, entering into a space in which both can co-create together. Nestled among the eleven pieces of sheet music in the book is a selection of art and photographs from Nils’ father, Klaus Frahm, taken from a project named ‘Fragments’. Shot in rural Portugal, the images were produced by experimenting with liquid light-sensitive emulsion using a brush. Their hand-made aesthetic and character marry perfectly with the expressive ethos of SHEETS and denote the great thought, care, and attention to detail that makes Zwei so special as a bespoke hand-made item. The music is presented in such a way that reflects Nils’ no-rules approach to music making. Seeking to go beyond the strict limitations that sheet music may often evoke, the pieces are more of a blueprint with which players are encouraged to reinterpret, modify and make their own: Zwei is an open invitation from Nils for piano enthusiasts to explore their own creativity and simply spend time to enjoy playing. There’s a light-heartedness about the book that makes the music accessible for both the highly skilled and the beginner pianist. Like his music, Nils’ introductory words are warm and sensitive, and there’s an underlying humour (in places such as the performance notes and diagrams) that make clear his intentions for Zwei as an opportunity to share his music with fans in a relaxed environment and allow them to engage with it in ways previously unavailable. SHEETS Zwei is published by Manners McDade, distributed by Faber Music and includes a download of music transcribed in the book, from Erased Tapes Records.